The [scene] backdrop. an African Gray parrot. a 1st .015 foot wide and .015 foot deep and .27 foot tall red cylinder leans to the right. it is -.21 foot left of and -.455 foot above and -.17 foot in front of the parrot. a 2nd .015 foot wide and .015 foot deep and .27 foot tall red cylinder leans to the left. it is -.025 foot right of the 1st cylinder. a [metal] whistle is -.01 foot beneath the cylinders. the whistle faces right. it leans 90 degrees to the right. The [image-12476] backdrop. The fur goat. 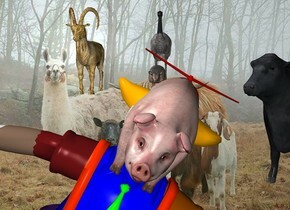 The large animal is behind and two feet to the right of the goat. the bird is one foot behind the animal. the large [flower] cow is 1 feet to the right and -12 feet above the animal. it is facing southwest. the cow is 15 feet in front of the animal. 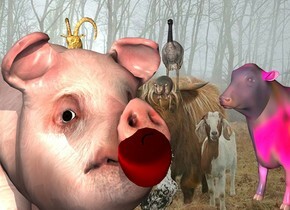 the large pig is 15 feet in front and -4 feet to the left of the bird. it is -8 feet above the bird. it is leaning 35 degrees to the back. it is facing southeast. the apple is -1.45 feet in front and -2.5 foot above the pig. it is -5.4 feet to the left of the pig. it is leaning 35 degrees to the front. the tan light is 5 inches above and 3 inches in front of the apple. The [scene] backdrop. a woman faces southwest. a pink woman is left of the woman. a yellow woman is left of the woman. she faces southeast. The [image-12476] backdrop. The fur goat. 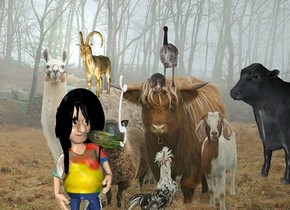 The large animal is behind and two feet to the right of the goat. the bird is one foot behind the animal. the large cow is 3 feet to the right and -12 feet above the animal. it is facing southwest. the boy is 15 feet in front and -9 feet above the bird. he is -3 feet to the left of the bird. He is facing southeast. The [image-12476] backdrop. The fur goat. 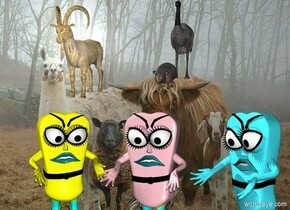 The large animal is behind and two feet to the right of the goat. the bird is one foot behind the animal. the large cow is 3 feet to the right and -12 feet above the animal. it is facing southwest. the boy is 8 feet to the left and -14 feet above the bird. The large red cone is above and -2.2 feet to the left of the boy. the large rake is in front of the boy. It is facing right. It is leaning 20 degrees to the front. The [image-12476] backdrop. The fur goat. 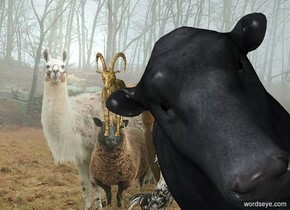 The large animal is behind and two feet to the right of the goat. the bird is one foot behind the animal. the large cow is 3 feet to the right and -12 feet above the animal. it is facing southwest. the clown is 18 feet in front and -10 feet above the bird. he is leaning 30 degrees to the left. the pig is -3.2 feet above the clown. it is 1.6 feet tall. it is -5.75 feet to the left of the clown. it is leaning 30 degrees to the left. The [image-12476] backdrop. The fur goat. 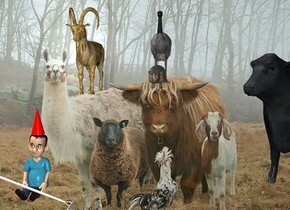 The large animal is behind and two feet to the right of the goat. the bird is one foot behind the animal. the cow is 15 feet in front of the animal. it is leaning 30 degrees to the right. The [image-12476] backdrop. The fur goat. 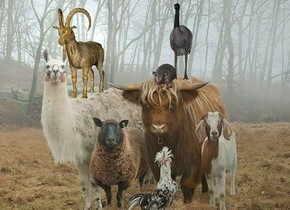 The large animal is behind and two feet to the right of the goat. 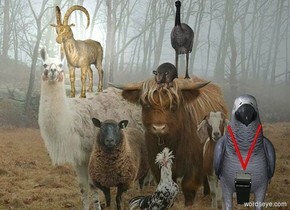 the bird is one foot behind the animal.